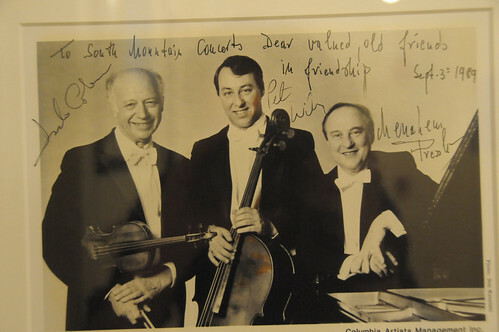 ArtistLed’s critically-acclaimed recording of Schubert’s piano trios led to a national tour this season, which began Sunday at the legendary South Mountain Concerts series in Pittsfield, Massachusetts. Joined by Emerson Quartet violinist Philip Setzer, Wu Han and David performed for a sold-out house of listeners eager to hear Schubert’s masterpieces in the hands of some of their favorite artists. 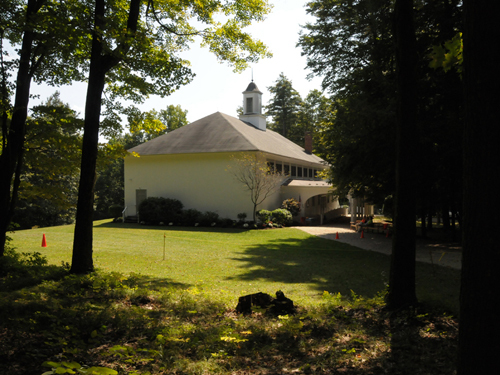 One of America’s most special places to hear music is the Concert Hall of South Mountain Concerts, located atop a beautiful wooded mountain just south of Pittsfield, Massachusetts in the Berkshire Hills. Founded in 1918 by the legendary American patroness of music, Elizabeth Sprague Coolidge, the hall was built especially for chamber music, seating 440, and is now on the National Register of Historic Buildings. 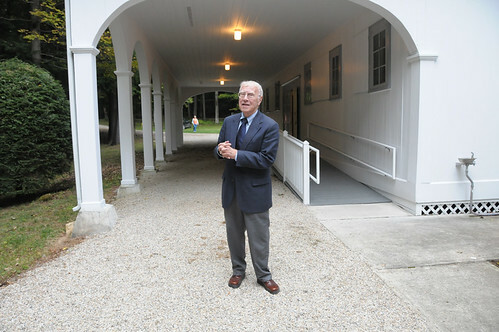 The hall’s construction – a simple box shape with wooden surfaces, a gentle slope to the stage, and a high ceiling – provides some of the best acoustics for chamber music that can be found anywhere. Simplicity is the keyword at South Mountain. 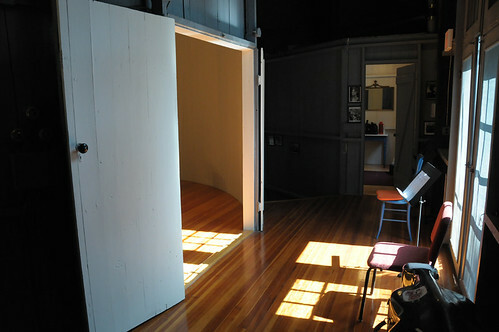 The backstage rooms are rustic but provide every amenity that is needed. 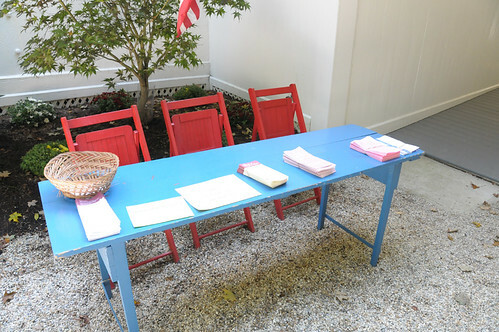 The box office is a wooden farm table that can be moved under the porch in case of rain. 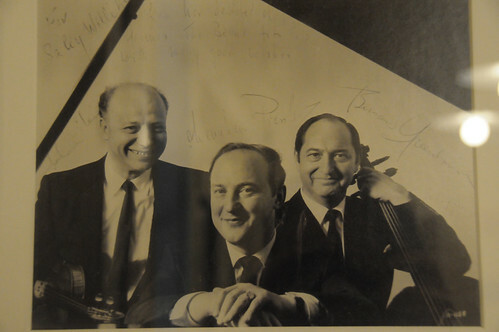 From the inception of the concert series the programming was intelligent and varied, and featured some of the most distinguished performers of the times. Mrs. Coolidge was extremely dedicated to new music, and commissioned many works from leading composers of the day that were premiered at South Mountain, by Ernest Bloch, Anton Webern, Frank Bridge, Roy Harris, Bohuslav Martinu, Arnold Schoenberg, and Ottorino Respighi, to name a few. 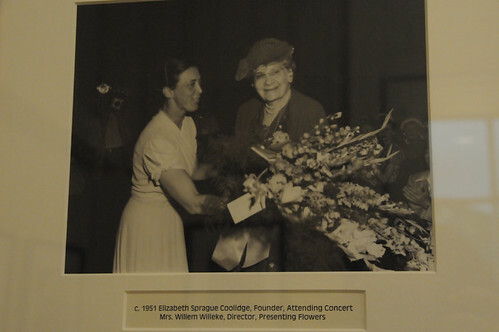 Mrs. Coolidge, a resident of Pittsfield, also established two resident ensembles, the Berkshire Quartet and the Elschuco Trio, which performed numerous series of concerts in mini-festivals at the hall. 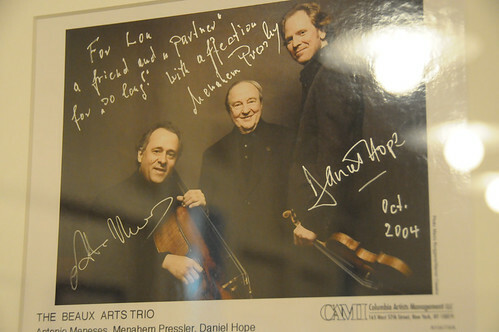 Other artists who have performed there include Leonard Bernstein, Gary Graffman, Lilian Kallir, Leontyne Price, Peter and Rudolf Serkin, Alexander Schneider, and countless string quartets. 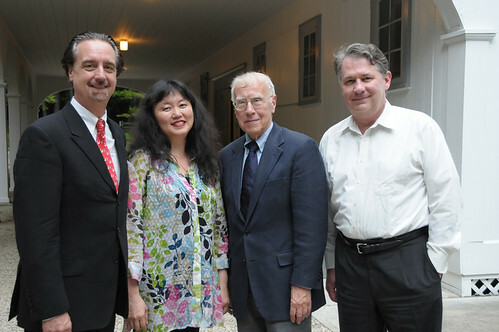 Over the years, most of the world’s distinguished ensembles have been regular performers at South Mountain. The large collection of backstage photographs, inscribed to the hall, testifies to the diversity and depth of the programming. 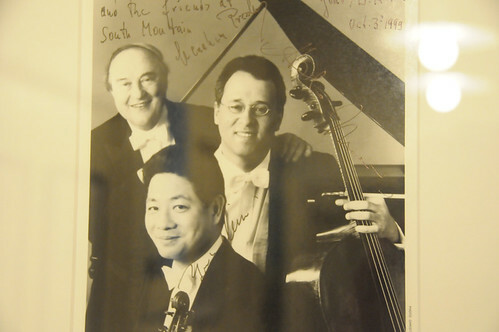 Illustrating South Mountain’s commitment to ensembles of quality is the collection in its gallery of photographs of almost every configuration of the Beaux Arts Trio, which retired last season after 53 years. 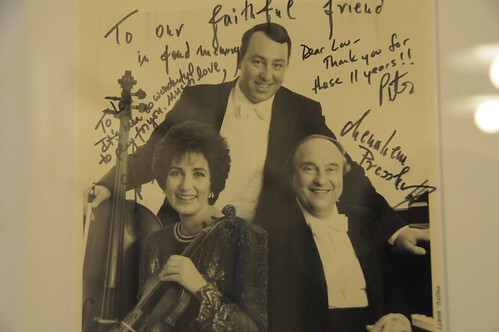 In the photos below you will see violinists Isidore Cohen, Ida Kavafian, Young-Uck Kim and Daniel Hope, as well as cellists Bernard Greenhouse, Peter Wiley, and Antonio Meneses. 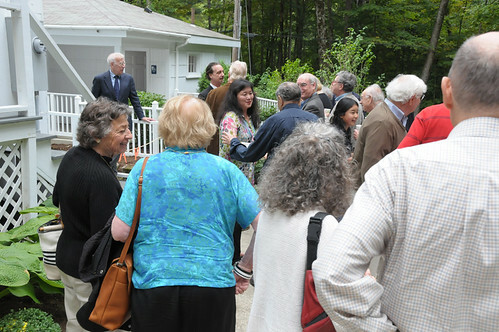 After the concert, the artists gather with the public and are served refreshments in the tranquil wooded setting behind the hall. Today the series is run with enthusiasm and integrity by Lou Steigler, who has led the organization since 1987. I am honored to be a frequent performer at South Mountain, an organization which I hold in deep admiration and affection.